¡Stay up to date and get informed! Periodically of the latest XLRS news, their professional systems Radio Control. Use the new DMD_Studio V:4.49 version or higher with the current firmware. Access to the new update (Firmwares and information), click here: UPDATE 02-OCT-2018. MAVLINK and transparent radio modem: Several bugs have been removed depending on the configuration packages were lost. Now it works 100%. Frequency Hopping Spread Spectrum (FHSS): Improved general operation 40 hops/sec. with RC, XLRS telemetry and Mavlink. FHSS: A secret code has been added to encrypt the pseudo-random jumps, this makes it very difficult to decode the data packets by unauthorized individuals, avoiding theft of drones by impersonation. Radio control: An additional security byte has been added to the RC packages (joysticks, servos, etc.) as well as valid data filtering at the input of servos and mixer. BLUETOOTH + MAVLINK: The Mavlink protocol has been activated and transparent via Bluetooth, now tablets, PCs or laptops without USB connection can be used directly. (This new functionality is only guaranteed for equipment manufactured as of September 2018. If your device is older and you can not configure the bluetooth to 38400b, contact the technical service, dmd@dmd.es). DMD_Studio: Multiple improvements to support new devices and all new features that have been added to devices in general. Note: Due to the previous changes the RF data packets are incompatible with previous versions so you must update the transmitters and also the receivers. New diagrams have been added in the manual to show more examples. 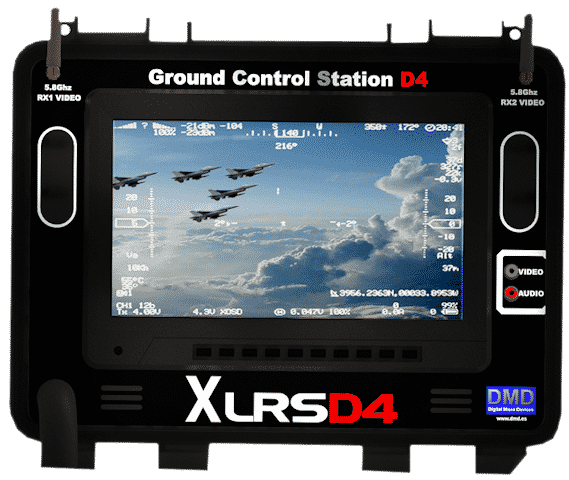 XLRS Radio Control and Telemetry + Digital Video. Link 2 TX(XPAD) + 1 RX(RXLRS) in a distance of 10Km. To see more diagrams click here: Connection diagrams XLRS 2018. ¡New XLRS Partner in Germany! We welcome Copter Squad UAS as a new DMD partner. 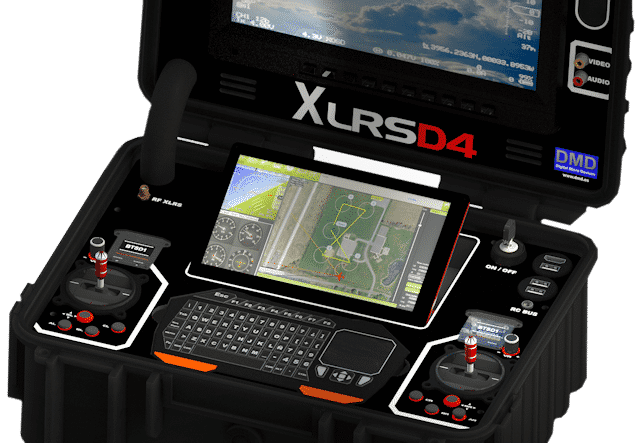 Manufacturer of Drones in Germany, incorporating XLRS systems into its products. Copter Squad offers micro drones technology for industry, public services and research. Our flight systems are suitable for operations in film and photography, industrial plants, geodesy, agriculture and forestry, emergency services and many more. In cooperation with partners we offer complete solutions. ¡New Video XLRS, modify joysticks in XLRS Transmitter from Mode2 to Mode1! Example to modify joysticks of the XLRS Transmitter from Mode2 to Mode1. ¡New Video XLRS in FHSS and Mavlink with BLUETOOTH (New firmware update)! XLRSD3 (433Mhz) in FHSS mode (Mavlink Bluetooth) + Pixhawk + Mission Planner, write and read Waypoints. ¡New Video XLRS in FHSS and Mavlink with USB (New firmware update)! ¡Oopart delivers systems XLRS in Colombia! Oopart distributor XLRS systems in Colombia, delivers systems to the Colombian army, high mountain battalion nº2. GCSD4 Presentation. 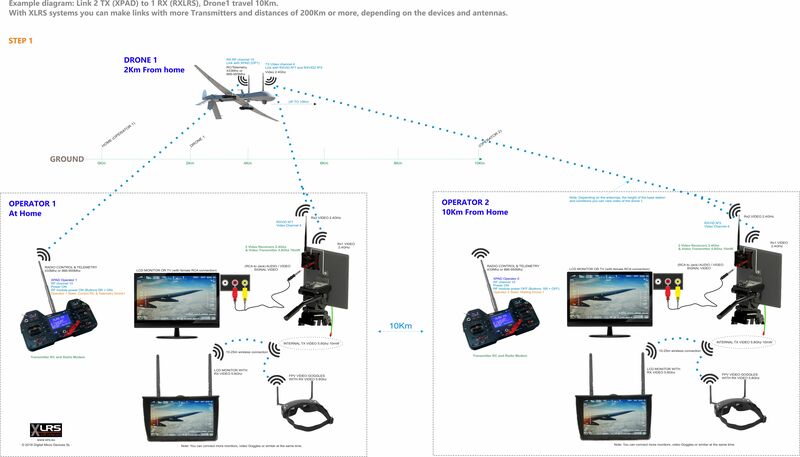 Ground Control Station D4 for FPV & UAV. ¡New RXVID2-1C video receiver version! New version 1C of the analog video receiver RXVID, already in production. It is compatible with the previous version with very interesting improvements: By the local speaker, in addition to alarms and warnings, now you can hear the sound of the microphone in XOSD in flight. This option can be configured from DMDStudio. The diversity has been improved, now the settings are independent for each receiver. A new hardware setting, now you can adjust the output brightness of each receiver to be exactly the same. In DMD the idea is to update and improve the products in periods of a few months to evolve the XLRS system continuously. ¡New XLRS Partner in Pakistan! We welcome to Sysverve as new DMD partner. 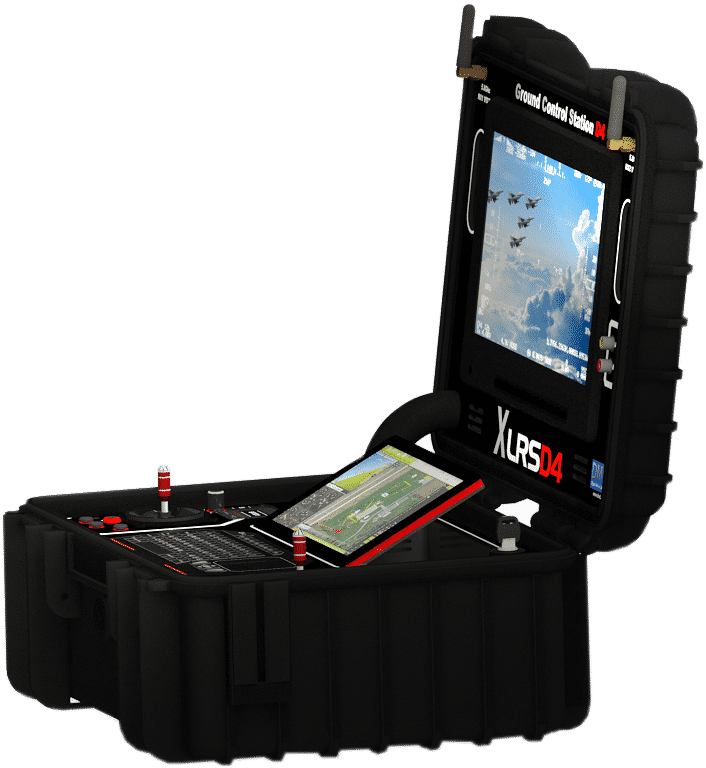 Manufacturer of UAV in Pakistan, incorporating XLRS systems into its products. ¡New XLRS Partner XLRS in Italy! We welcome to Cardtech SRL as new DMD partner. 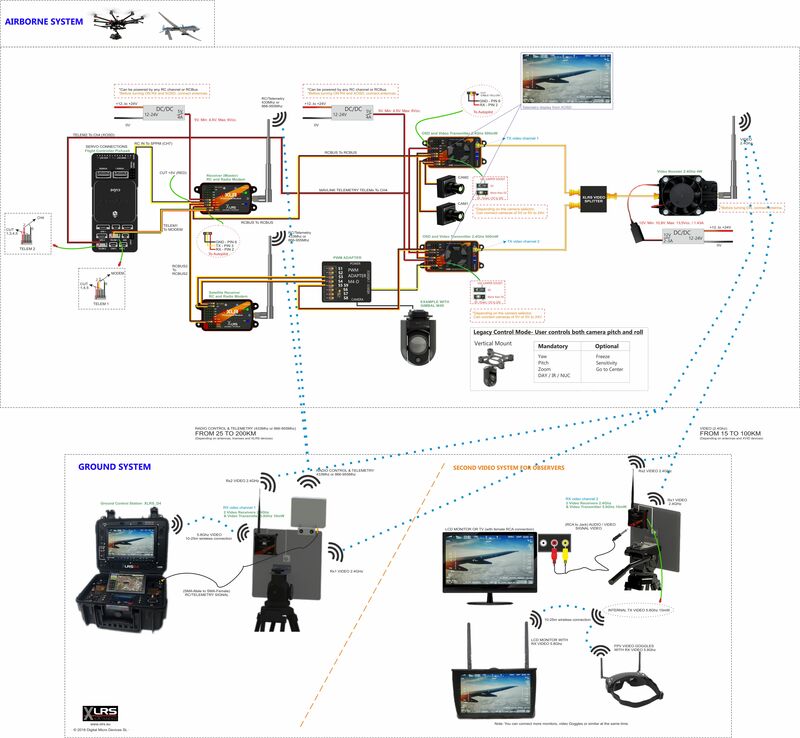 Manufacturer of Drones in Italy, incorporating XLRS systems into its products. Video Booster BOOST24G4W: Available in Shop DMD. ¡New Video XLRSD3 + XVID + Pixhawk! ¡New Video XLRSD2 + Pixhawk + Mission Planner! ¡New XLRS 2018 Connection diagrams! The majority of the connection diagrams of the XLRS systems D1, D2, D3, D4 and XVID have been updated for better understanding and we have also added new diagrams to show more examples. ¡New Manual and Datasheet, Vídeo Booster BOOST24G4W! ¡New XLRS Partner in Italy! We welcome Pro S3 Unmanned Technologies (Pros3) as new DMD partner. ¡New XLRS Distributor in Myanmar! We welcome Communication & Commerce (COM & COM) and Terabit Wave as news DMD distributors. They offer networking services, infraestructure (O&M) and consultancy in the telecommunications industry in Myanmar, incorporating XLRS systems into their products and services. ¡New XLRS Distributor in Turkey! We welcome Hobicim as new distributor of XLRS systems. ¡New Video DMDStudio – XOSD! ¡New XLRS Partner in Canada! We welcome Infinite jib as new DMD Partner. 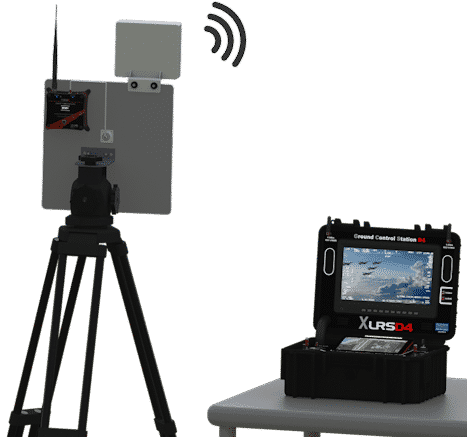 Manufacturer of Drones in Canadá, incorporating XLRS systems into its products. It is added in the XLRS systems manual the RXLRS module with all information and the new datasheet. The XLRS_D1 systems datasheet has been modified and renewed. RXLRS receiver: Available in Shop DMD. 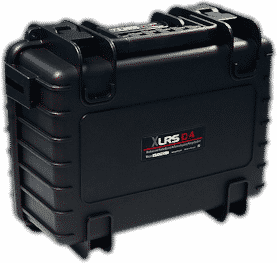 XLRS systems with RXLRS: From today all XLRS systems will include the RXLRS receiver. The RMD1, RXD2 and RXD3 receivers have been replaced by RXLRS. RXD3, RXD2 and RMD1 are obsolete, (Obsolete XLRS manuals). XLRS RF modules of 433Mhz: From today in the DMD shop when you select an XLRS system you can choose the frequency band of 866-955Mhz or 433Mhz. Use new version of DMD_Studio V:4.10 or higher with the current firmware. When used channel 9 and 10 with values <>0, the trims changed their value randomly. Corrected. ¡ New RXLRS receiver ! Introducing the new RXLRS receiver, it replaces the RXD3, RXD2 and RMD1, is more modern and updated. The benefits and range for D1, D2, D3 and D4 system in this receiver are selected through software licenses. We have recently updated the firmware of all receivers and this version is the same for the new RXLRS receiver. In the future the new receiver will have more functions since it has a processor with double memory. The RXLRS receiver is 100% compatible in hardware, with the RXD3, RXD2 and RMD1 receivers. The RXD3, RXD2 and RMD1 receivers are out of production. ESD protection and RF Filters in USB. New Firwmare compatible 15 march 2018. The current operation it is the same as the other receivers, so the manuals are similar. How the manuals are On-Line they will be progressively updated with the new functions of the RXLRS receiver. Multiple corrections and improvements in XOSD. We add the default configuration of pages 1, 2 and 3 of the XOSD. ¡ New XOSD V2 ! Improved PCB, more precision painting pixels. Improved box in general, more robust, screws threaded onto metal. ESD Protection and RF Filters in input cameras. ESD Protection (static) for all pins includins servos. Protection servo pins against short circuits and overloads. Motor-Accelerator: Graphic position display and % or Watts. Battery Voltage: Up to 65V. (If hardware device supports). PLANE MODE: Autopilot Mode. Manual, Auto, Stab, etc, 19 configurable modes. Control from XPAD: Integrated system. Select the camera, change the brightness, the OSD page, etc, from the XPAD in flight. Prepared to use two OSDs simultaneously. Control 4 cameras and 2 simultaneous. ¡ New hardware version video receiver RXVID2 ! The PCB has been improved in general. Buzzer is changed by audio amplifier and speaker. Changes to better select the ON/OFF switch. ¡New XLRS Partner in France! ¡ New Vídeo Booster 2.4Ghz 4W ! ¡Increase the range of you XLRS video system with the new video booster 2.4Ghz and 4W! Ranges of 80 to 100Km with 5dBi antennas on plane and 24dBi o ground. Robust machined aluminum case with fan. In an RF amplifier it is important not to get hot, the Video Booster is specially prepared to work with continuous carrier CW (analog video) with cooling forced by fan. Available for sale soon, you can make reservations on shop DMD. Attention: It doesn’t work for WIFI. Before using a Video Booster: Consult the regulations of your country. ¡New XLRS Partner in Myanmar! Welcome POSH Co, UAV Manufacturer. New Partner of XLRS products in Myanmar. ¡New XLRS Partner in UK! 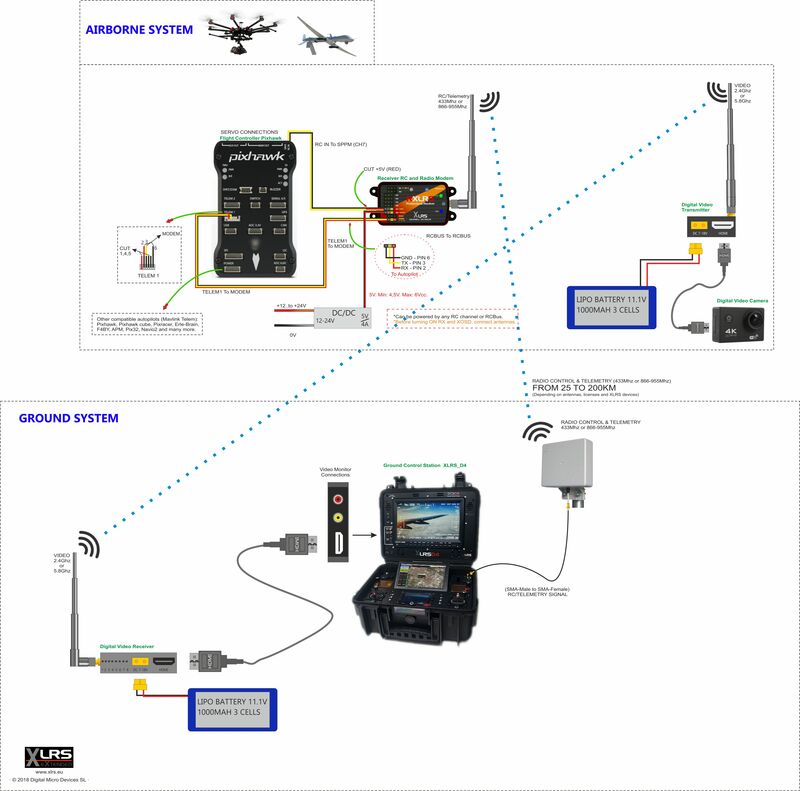 With over 17 years of development experience covering a wide variety of VTOL multi-rotor aircraft, we now offer some of the toughest and most durable industrial UAV solutions in the world. We have a range of ‘off the shelf’ airframes, related products and complete aircraft systems, but most of our work is custom or fully bespoke. Unlike other companies we do not produce fixed products and offer them to market in the hope they are suitable, but instead specify and optimise systems to most suit the specific application and requirements of the customer. With our in house design and manufacturing capability we are uniquely able to offer a full design, prototyping and production service for those with a specific requirement. If you need an ‘outside the box’ solution, we’re the company to talk. 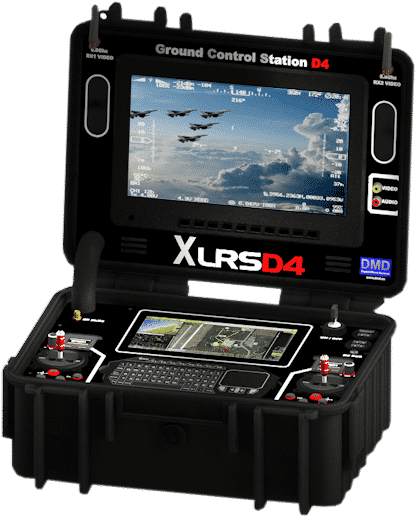 We present the latest news in Digital Micro Devices, the new XLRS D4 system with the GCSD4(Ground Control Station D4). D4 is an evolution and improvement of the XLRS D3 systems. It is compatible with all XLRS systems. Now you can have a complete system in a robust suitcase, compact and easy to transport. You do not need a laptop anymore. XLRS D4 is not yet for sale. In a few days you can make reservations in the web store. Customers who make their reservation will have multiple advantages we will inform you as soon as possible. The most powerful and modern DMD radio control system with Joysticks, buttons, encoders, etc. Several OLED displays to continuously inform the pilot. Embedded PC with Windows 10, integrated in the system and with the software already installed and tested. IPS Touch screen 7″ for PC. Screen for analog video of long range and high brightness, visible with sunlight. since for a long range it is a good solution. (other frequencies on demand). We are preparing new antennas and amplifiers for those customers who need to reach more. since it retransmits the video to 5.8Ghz for the monitor of the suitcase, without cables. > At the same time you can use video glasses with a 5.8Ghz receiver. For RC we selected a patch of 6-9dBi that will guarantee us a maximum range of 200km. We are preparing new antennas for 866-915Mhz with 12dBi that will increase the range even more. The video is delivered with a patch of 17dBi. To reach more optionally you can use a parabolic of 24dBi or more. New update Receiver RXD3 V:3.34b789. Bug in MIX: When using an extended button as GL or HL, if there was any assignment to I1L or I2L it didn’t work or canceled the button assignment. Corrected. Updated information on button assignment and priorities in the DMDStudio manual..
Now the priorities of the buttons are explained and switches that can be very useful when you want a button or switch to cancel or have priority over other active switches on the same servo or object.